Technically speaking, the foundation and basic principles of San Shou Shuai Jiao are based on traditional Chinese wrestling (Chuan Tong Shuai Jiao) and adapted for combat training. San Shou Shuai Jiao techniques and principles are very simple, effective and—most important—quick. Technically speaking, the foundation and basic principles of San Shou Shuai Jiao are based on traditional Chinese wrestling (Chuan Tong Shuai Jiao) and adapted for combat training. San Shou Shuai Jiao techniques and principles are very simple, effective and—most important—quick. Because of its speed and effectiveness, an opponent often does not have a chance to fight back. Shuai Jiao is an art that does not just rely on muscular strength—it must be done skillfully. It always emphasizes avoiding direct impact with an enemy's power. It also emphasizes getting close to an enemy quickly and using the enemy's power against himself. Because of its effectiveness, Shuai Jiao has been trained along with all styles of Chinese martial arts for thousands of years. Shuai Jiao can cause tremendous physical damage to an opponent. The severity of the damage is dependent on the degree of power used in the technique. Moderate use of power can quickly throw down an opponent and disable his fighting ability. Excessive use of power can permanently injure an opponent. Therefore, the value of Shuai Jiao has been recognized by Chinese martial artists for centuries. Even with today's modern military technology, Shuai Jiao is still an important combat skill. In China today it is used to train the police, the military, and Special Forces. In general when fighting, the conflict becomes a competition of power, speed, technique, and adaptability to changing situations. The goal is to quickly disable your opponent's fighting ability so that he cannot fight back. When fighting on the street, you cannot risk tangling with your opponent too long. You need to end the fight as soon as possible, especially if you are facing more than one opponent. Shuai Jiao is perfectly suitable for self-defense on the street because it specializes in throwing techniques to disable an opponent's fighting ability. Throwing techniques can be used whether you initiate the attack or are defending against one. Almost every part of your body can be used against an opponent. The most common body parts used are: head, hands, elbow, shoulder, foot, knees and hips. San Shou Shuai Jiao is a special kind of martial art technique used to throw or take down an opponent very fast. This art shares many similarities with other wrestling styles, especially traditional Chinese wrestling and Japanese Jujitsu and Judo. This is no surprise because Shuai Jiao's foundation is based on traditional Chinese wrestling, and traditional Chinese wrestling influenced Jujitsu and Judo. Many martial arts historians believe that it was Chinese wrestling that greatly influenced the soft arts of Japan. During the late Ming dynasty, a government officer and martial artist named Chen, Yuan-Yun (A. D. 1587-1671) fled China to Japan in the year A.D. 1659 and later taught martial arts there. This is recorded in Japan's history documents Collection of Ancestor's Conversations, Volume 2, Biography of Chen, Yuan-Yun. The Japanese built a monument to honor his contributions to Japan's martial arts. This monument still stands outside of a temple in Tokyo. 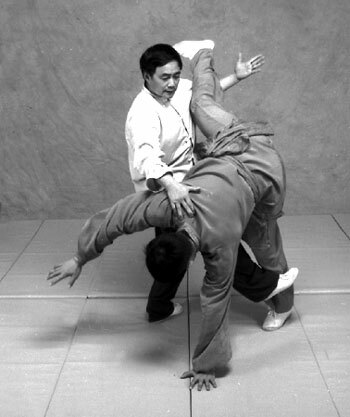 Although Shuai Jiao shares some similarities with traditional wrestling and other arts, from a technical point of view, Shuai Jiao's technique construction, basic principles, applications and purposes are quite different from the rest. These differences are Shuai Jiao's distinctive characteristics. First, compared to traditional Chinese wrestling, Jujitsu and Judo, San Shou Shuai Jiao emphasizes more speed when throwing. In contrast, traditional wrestling, Jujitsu and Judo emphasize obtaining good grappling position on an opponent's body or uniform first, and then applying the throw. In this way, it takes more time to throw down an opponent. Second, San Shou Shuai Jiao incorporates kicking and punching techniques, always combining hand and leg techniques. However, traditional wrestling, Jujitsu and Judo, especially the sport varieties, do not emphasize these techniques. Third, unlike Greco-Roman and free-style wrestling, Jujitsu, and Judo, San Shou Shuai Jiao generally avoids falling to the ground and grappling too long with an opponent. One simple reason is that it is dangerous to tangle with an opponent on the ground in a real fight, especially if you face multiple opponents. These differences do not imply that one style is superior to another. Fighting is a very complicated subject. There are many factors behind victory. Winning a fight depends on situation, timing, location, skills, strength, and the spirit of the individual. It does not depend on the style itself. As a martial artist, keep an open mind to accept and absorb the effective elements of other styles. In turn, it will help to bring your skill to a higher level.